Why choose an Exposed spray tan? I have used Exposed spray tan solutions for around three years, from it’s first launch in fact, and it is by far the best solution I have ever used. Exposed is virtually odourless, does not transfer to bedding (unless you have a particularly sweaty night), and has a light guide colour which develops gradually. This means you can go out and about whilst developing and don’t have the ‘covered in mud’ look. The colour is very natural, comes in shades light to extra dark, and has no orange tint. What is an Exposed spray tan? In my eight years of spray tanning I have used most of the well known brands and a few lesser known ones. Everyone thinks the big names are the best because everyone has heard of them but this is far from the truth. They have large marketing budgets to get their name out there but in my experience the products do not live up to expectations. 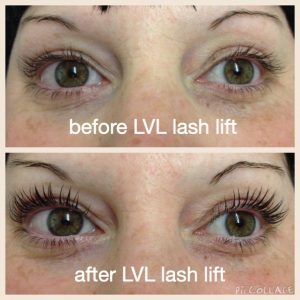 Created by Nouveau Lashes, LVL stands for length-volume-lift. It is a revolutionary natural lash treatment that straightens your eyelashes at the root, creating the effect of longer, lifted lashes. The effect lasts for a maintenance free 6-8 weeks, especially if you use the conditioning serum. The process takes 45-60 minutes and the results are immediate. The lashes are also tinted giving the effect of wearing mascara.